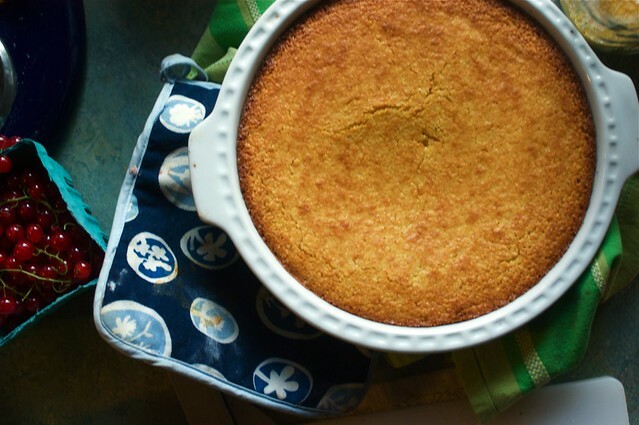 I have been wanting for weeks to tell you about this cornbread. Look at that golden crust. Don’t you just want to admire it for awhile? Oh, you don’t? You’d rather cut a slice and dive right in? Understandable. Be my guest. I had this piece gathering in my mind, about the essential subjective quality of recipes. How you may love a dish, and I may want to spit it out. How, no matter how well written a recipe is, someone is going to say it stinks. How we all start from a different place, and so we are all reading a different book really, and how reviews are somewhat specious, therefore. Yeah. It sounded that garbled in my head, too. Really, what I wanted to tell you is that I hate Reggie Jackson. In the World Series of 1978, he thrust out his hip while he was running from 1st to 2nd base, to deflect the ball, and thus be safe. Cheater. This much-replayed incident started a chain of events that broke down my beloved Dodgers, who should have been the real victors of that series. This was the second year in a row that the Yankees beat the Dodgers, breaking my 12-year-old heart. And so, I hate the Yankees. Sorry to lose you if you’re a fan of the pinstripes. That’s just the way it is. Any association I have with the Yankees is going to be tainted. I’m never going to like them. Or the bleacher bums in right field who shout out obscenities as they slosh beer on their chests in their drunken quest to pump their fists and berate the right fielder playing beneath them. Even when he’s from their own team. So if you asked me to read a book about the Yankees, no matter how well written or compelling a read it is, I’d probably not be able to recommend it to anyone else. Just because I’d be scrunching my lips while I read it. The same is true for recipes. Okay, here’s the deal. I’m not making any sense. It’s so damned hot here that my brain has clearly melted. Yesterday, the temperature was 103°. That’s right. 103°. The hottest day in Seattle recorded history. No one here is equipped for this. We don’t have air conditioning. I rubbed so many ice cubes on my wrists and behind my ears that the ice maker stopped working. I wet my hair so many times during the day in an attempt to cool down that it is now ratted up like some archetypal image of a tough girl from the 50s. Only not that hip. This didn’t make me feel better. Instead, I have been humming Beethoven’s 5th Symphony all morning. Yesterday, at nearly the peak of heat, the power went out for much of the island. Kaput. Transformers blown because of the heat and lightning strikes. This meant no fans, no refrigerator, no relief from the heat pressing on our bodies. Poor Little Bean was freaked out by the sweat on her face. She had never sweated before. We held our cool as much as we could. There’s one 4-foot spot on the front deck where a breeze the equivalent of an old man pursing his lips and blowing out sometimes shuddered across our feet. We stayed there. When the fan started whirring its white noise again, we cheered. Power back on. Everything up and running. Except the internet. And I had to make the last changes to the first chunk of our manuscript and send it to our editor last night, before our trip. So a call to the cable company, to see what happened. When the guy on the phone (who was clearly in a cooler place) asked me to check the connection on the modem, I had to crawl under the table holding the computer. Not only did I find shriveled mosquito wasps and spider webs, but I had to pant to breathe. 112° down there, I’m sure. I stood up and had 1/2 cup of sweat on my face. Have I mentioned that I hate this? Almost as much as the Yankees. All is better now. The internet started working again. I made the last changes and pressed send at nearly 10. The baby did eventually fall asleep. Danny and I stayed up until midnight, packing our clothes and the baby’s toys. The temperature inside the house was a much cooler 91°. And now I’m up, at 5 am, trying to write this piece about cornbread, before we take off for Colorado today. Rocky mountain high, indeed  it’s supposed to be only 70° in the mountains. We’re leaving for a family wedding, a joyful reunion of all the Aherns. Much laughter will ensue. All will be well. There’s still much to do. Danny will be up soon, to help me finish cleaning the house, so that our friends who are staying here while we are gone don’t have to find all those dead moths, the ones fried by the heat as well. But right now, it’s only 75° in the house. Beethoven is fading. We can’t wait for a vacation. Hm. I still didn’t tell you about the cornbread. But I feel strangely better now. My dear friend Tita is the wisest person I know. She’s loving and generous, but she also has no time to waste. If something seems ridiculous to her, she wants nothing of it. (You should have seen her face when we were trying to explain molecular gastronomy to her.) She is a good cook, with no pretentions. So when she says, “This is the best recipe for cornbread I have ever made,” I listened. And she’s right. This is fluffy cornbread, full of corn taste with just the tiniest gravitas because of the cornmeal. I love that it’s adapted from a book Tita received as a birthday present in 1972. “Everything I have ever baked out of that book has worked.” And gluten-free? With these flours, it’s indistiguishable. It’s just good. Tita had some at our house the other evening, and she loved it. Couldn’t tell the difference. Preparing to cook. Heat the oven to 425°. Mixing the dry ingredients. Combine the flours by sifting them into a large bowl. Add the remaining dry ingredients and stir. Adding the wet ingredients. Combine the eggs and milk in a small bowl. Make a well in the center of the dry ingredients and pour in the liquid. Stir with a rubber spatula until everything is combined. Finishing the batter. Stir in the cornmeal, whisking fast, until it is just combined. Do not overstir. Is this better than the cornbread in your book? Because we SWEAR by that! (It's awesome the next day as French Toast. mmmmmm….) Now I'll have to try this this weekend! Enjoy your trip and the cool air. We are in Portland where it reached 106 yesterday and it's just plain miserable to go do anything . . . so I know what you mean! Looking forward to trying the cornbread recipe!! I'm really glad you made it through. We had a day like that last summer and I'll never forget it. It never gets that hot in Maine either. Maine, Seattle, same thing basically. I was so excited when I saw your recipe for gf cornbread. I've been wanting cornbread all week. But, then a glitch. We also can't eat potatoe – yeah, try that one on for size. No gluten, and no potatoe products. Major monkey wrench. Thank you for sharing it though. Maybe I can experiment with it some more. I tried this recipe with a legume based all purpose flour no potato flour in there. It was spectacular!!! I also let all the mixed ingredients sit for about 2 hr to let the cornmeal and legume flours soak and moisten and it really made the difference. it was still as fluffy and toasty as can be but moist and beautiful. Also, I successfully substitued solid coconut oil for shortening because I didn’t have any. Sweating with you. Argh. This is madness. Please tell me you weren't baking yesterday. I couldn't even bring myself to turn the stove on for tea. We've been haging Seattle weather here in Denver all week – I would happily trade you! Enjoy your Colorado vacation. OK, so the Northeast and the Northwest seem to have switched climates. I live in New Jersey, and we're aiming for the coolest July on record, or close to it, and pretty rainy, after one of the rainiest June's on record too. I actually wrote on Facebook last month that we had Seattle's rain, and would gladly return it. Have fun in Colorado. The cornbread looks delish. In Eugene, we have also had record melting heat – yesterday it was 110 for the second day in a row. And I love the comments about the Yankees – they are the team my family most likes to see lose. Especially if they are playing the Mariners! As for the cornbread, it looks scrumptious, but I will wait until the house is below 90 before using the oven! Speaking of adapting- that is just what we've all been doing living GF. Thanks for adapting the cornbread recipe, I know Booth will love it, but not until it cools down here. We are sticking to the grill, and sticking to the chairs, and sticking to our clothes. Having lived most of my life in the Intermountain West, I know all about hothothot summers. A little trick I learned ages ago for keeping cool: an ice cube in your bra. Right there in your cleavage. I don't know why it helps, but it does, as does a cool, damp wash cloth on the back of your neck. Good luck surviving the heat if it hasn't settled again by the time you get back. I remember your Cornbread for a Cold Night! Oh dear, you must have been so hot and wishing for that cold night! Looks delightful! Can't wait to try it. I grew up in Texas, the heat and humidity there, in the summer, would be EXACTLY like you described, for days on end in the 100's plus. That is what I knew summer as, until I moved to Washington state! I will take a dry 70-80 ish, any day over Texas heat, and when it gets too hot (since the sun is very intense here) we head to the beach or the mountains. Hope you enjoy your trip to cool colorful Colorado to see family! I feel your pain… we've had 26+ days of over 100 degree heat, although we do have A/C. Still hot. Too hot to turn on the oven or go to the store to buy food. I think my body is storing fat… it must think it's a natural disaster or something. Made a version of this yesterday with lemon juice, zest and blueberries and a touch of sugar. So good. Even the non-GFs in my house are gobbling it up. I don’t have any shortening in the house and I’m far from the store. Can I substitute butter for shortening in the cornbread recipe? Thanks for your reply. Welcome to chilly Colorado. We have switched weather with Seattle. We have had constant rain since the end of May. This week feels like Autumn has arrived early. My husband and I could see our breath yesterday evening and we live at 5000 feet!!! I usually hold out for the end of August to relax and feel cozy when it cools down. This year there will be NO transition because we have not had any HEAT. So even though the heat is a pain….I kind of envy your situation. I bet your tomatoes are getting ripe on the vines (mine are forever green). Hope you enjoy our cool weather!!! Oh memories of cornbread. I wish I could have dairy and those other grains. Maybe I'll try it with some other flours and see if it works! As much as you were suffering in the heat, I almost hate to tell you, this blog brought me needed laughter. Hope you all soon get some relief. Oh, and the cornbread does look good. Try holding the ice or water glass to your actual ear. The air currents or whatever seem to give you brain freeze and cool you from the inside out. Between that and keeping your feet in a pool of cool water- you can really cool down. Figured out the first when I worked at an amusement park one summer. Cornbread come get me some. There is actually a song by the Fania All Stars, a top salsa band with that line in it. I did have the cornbread at Babycakes and it was very good. I tried a gluten free mix recently but I think I overcooked it. Cornbread is on the money or as the Spanish expression goes "por la maceta". It looks AMAZING! But sadly I am also allergic to dairy and eggs so this lovely little recipe is a no go for me. Anyone know of a gluten dairy egg free blog or website? I'm having a dickens of a time finding anything. You need a little wading pool to get you through hot days! I have one big enough to float a raft in. Ahhhh! Gets me through hot days of gardening. I am corn-free, but I'm going to try your recipe substituting Bob's Red Mill millet meal. Just discovered it on their website. I've never seen it in any health food stores. Works great for dusting fish for a crispy crust. Thanks so much for the recipe! I may get up at 4:00, just to be able to make this cornbread, despite the heat! (This receipe is especially timely, since I can no longer find Bob's Red Mill GF Cornbread mix in our local stores. Enjoy the cooler temps in CO, not to mention the airconditioned airport. Take care! Whereas as I, in Atlantic Canada, have just welcomed summer this week! Until recently I was still wearing fleece pants. However, when we lived in Southern Ontario, summers were regularly blistering. The inside temperature in our brick house never went below 30C and we had no AC. It's hot here now but I'll still try the cornbread! As you sit in your heatwave in the Pacific Northwest, I'm sitting in one of the rainest and coolest summers in New York City history. I've baked more this summer than any previous…and I think I'm going to put this on my list! I love your tangents; somehow there is connectivity. I'd love to see that beautiful cornbread sliced so we can see the crumb. Shauna – this cornbread looks wonderful. I'd like to try and make it without eggs. Hmmmm, what to use as a sub? Not sure, I'll have to do some experimenting. Thanks so much for the inspiration! Applesauce is a wonderful egg sub! I use it all the time! I must say that it makes me feel so good that you still adapt recipes from Better Homes and Gardens!! It seems that I get most of my really good inspiration from 'normal' (is there any normal??) cookbooks and blogs. The heat has actually let up here – low 90's and lots of rain. We've had the AC on since March, though. Texas is just like that. We had similar weather down here in Portland, as Cegoodner said. We had a window A/C unit we kept in our attic, bought when southern friends were staying with us. It rained when they were here and we never used it. We almost forgot about it but then installed it and have kept the bedroom at 75 degrees for the last 4 days. It feels decadent. And I feel spoiled. But we put our girls (ages 5 and 3) on an air mattress on the floor and, miraculously, we all slept through the night. Worth. It. Have a great time on your trip. But are you driving or flying? That's a long trip with a Bean. when i saw "gluten-free cornbread" i thought that this was going to be a post about how of course cornbread is gluten free, cause there has never been any flour in it- only cornmeal. i live in NC and i have never heard of cornbread having flour in it. so it was bizarre to me to see all of these fancy ingredients- cornbread is just cornmeal, eggs, milk, oil (or drippings) salt, and baking powder. anyhow, i hope that you have a great vacation, and i hope that it is cooler when you return! phew! i was more afraid of you saying you were a yankees fan…i should've known better 😉 i'm a red sox fan here, so you won't lose me as a faithful reader! cornbread goes to the very soul of my southern roots. just seeing that photo makes me want to make a big batch of chili con carni & eat it with a big ole hunk of cornbread. Wow, you guys in the Northwest are frying. We have those outrageous temps here in the VA, but we do have AC. And, no electricity is never any fun, but wow, no fan even in that heat would be horrid. It's hard to believe Little Bean had never sweated before though. Sweat is a well-known concept here. 🙂 Glad you're headed to Colorado for cooler temps and family fun! The cornbread looks wonderful. Hard to beat good cornbread. I use a recipe that makes us quite happy that only use cornmeal, but I'll have to try this one. thank you for the cornbread recipe! I'm kind of jealous. It's winter where I live and only 9`Celsius [48`F]and cold enough to do dragon breath when we go outside. But I do feel your pain! Poor you, it doesn't get that hot here either but last summer we had a record 41`C day [105`F] and I was at a conference/camp so there was no lying in the shade under a sprinkler! I read each blog through blogging, and always forget to comment and be thankful! I'm sitting here eating a sandwich for lunch for the first time in a decade, with bread from your very recipe, and am so very thankful for the simple change of speed. I'll be visiting Seattle again soon and hopefully moving in the coming year. I'll search out the husband restaurant! I just made the cornbread and it is phenomenal. Texture and flavor are excellent-very cakey, for those who like their cornbread that way. With a little tweaking you could almost turn this into a pretty good cake/cupcake, although I can't figure out what kind of icing would best complement the sweet "corniness." Thank you for this wonderful gem! My wife is Floridian and I am Arkansan and until we moved to New Jersey we didn't even know there was corn bread with gluten in it to start with. Great recipe but someone accustomed to cakey cornbread would find it completely alien. can you substitute soy milk for milk in this recipe? my dr suggested this site for gluten free recipes and info. thanks! This is a beautiful cornbread recipe. However, because you don't like the NY Yankees, I'm afraid I'll to look elsewhere. Aw, darn. I had the same question Jodie did. Would soy or rice milk work in this, or is the dairy required? I realize this is a year late and a couple of dollar short, but the next time it gets that hot…or even just too hot, try drinking a hot cup of coffee. I know, that sounds kinda like the same as turning into the direction of the skid, but it warms your insides, which makes you notice the heat less. I wanted to share that with you because we are of kindred spirit in that at the age of 12, I too had my heart broken by my beloved Philadelphia Phillies. It's a pain that never leaves you. Wanted cornbread today and went to your blog to find it. And you are so right on it is the best … ever gluten free or not. I'm so used to baking and then tasting and saying "Well, not bad for gluten free." Fantastic recipe. As mentioned several times it's not just good in the gluten free category. My 'normal' guests loved this as well. I did not have sorghum flour so substituted buckwheat and it was perfect. I'm so glad I found this recipe. Thanks. I just found your site and I can't wait to try more recipes! We had this cornbread recipe tonight — I'm new to gluten-free cooking, so every meal is an "experiment" — and this one was great! I cooked it on top of a taco casserole and my husband couldn't even tell it was gluten-free; all the kids loved it, too 🙂 …now that's pretty rare. Thanks so much! Hi! I am wondering if you used leaf lard or regular lard in your cornbread? I don't have time to test it before I am serving to guests tonight as I just found this recipe although I will for the future. Just wondered if you already know the answer. Thanks! btw, I am making the carrot cake and ginger frosting from your new cookbook for my daughter's birthday tonight. Can't wait to try it! Indeed one of the best GF (or any) cornbread recipes I've tried. Didn't have shortening on hand so I cut in butter– loved the flavor. Used buttermilk. Also, was short just one of the GF flours (potato) so I used 1/3 of each of the others. Truly delish and so tender! The cornbread is awesome. so moist and soft yummy. Bought your book yesterday and reading it through. Love your stories and your passion for food is inspiring. Got me up and cooking a little today. Excellent cornbread recipe. I have tried several gluten-free recipes and this is difinitely the best. Kudos!!! Thank you. We're trialling eggs during Christmas break and I'm responsible for bringing cornbread for the family gathering tomorrow. Testing your recipe this evening subbing rice milk and, if eggs fail (and assuming I like the recipe ;), I'll be trying it with various egg subs. Hi, I enjoy your recipes, but I have a problem with potato flour. Could you suggest a substitute that would still give a nice texture? So I am just starting out on this Gluten free odyssey. Our son has Autism so he is now on the GF/CF diet and It’s pretty terrifying. I want to try your bread recipes; however, I’m a little gun shy, I have yet to find a gluten free bread that has a similar texture to bread, let alone taste. So far I have managed to bake breads that are both soggy and gritty all at the same time…. I know, it’s a gift. Our son has superhero taste buds (part of his sensory issues) so the bread so far is a no go. I just heard today that you have to toast gluten free bread in order to muscle it down, is that true? Try Udi’s or Katz. I cried when I tried their bread. It was soooo good. I also love Pamela’s bread mix. Throw it in a bread maker or mix it up, and it is definitely the best I’ve tried!!! Please, please adapt this with your new “no gums” approach (as per your more recent post on gluten-free muffins). Fingers crossed that it happens soon! You all need to do a second book, this one solely focused on baking and flour-based things – tarte tatins, upside-down cakes. Also would be great if you could delve into the world of sourdough, as preferable to yeast. Many thanks! Any chance you will be converting this recipe to grams/ounces? You have totally converted me to baking by weight! I just adapted your recipe to the “no gums” and “baking by weight” approach, and it turned out great! I also added some beans, ground beef, onions, green peppers, jalapenos and cheddar cheese to make it more of a Mexican cornbread casserole. First, I substituted the 1 cup of various flours with 140g of Ahern’s all-purpose flour. Last, I couldn’t find any lard-based shortening at the nearby Co-op, so I just used butter. I put in about 1/3 of the batter into the greased pan, added the casserole filling, and poured on the remaining batter on top. I baked the whole thing at a slightly lower oven temperature and added some cheese and green peppers on top for the last five minutes of baking. It turned out out so delicious, thanks to all your baking expertise! How can this be gluten-free when one of the ingredients is milk? It sounds wonderful but I have to ask this. Also, why are two different starches used? Can regular corn starch be used? What about the eggs, do they pose a problem for someone allergic to gluten or gluten intolerant? There is no gluten in milk. I just now discovered this recipe, but I am very excited to try it! I am also going to experiment and see if I can make sort of a “pizza” out of cornbread 🙂 Thank you for your inspiration to continue eating gluten free! I’ve just made this recipe and it is AWESOME!! Absolutely fluffy, “corny” and my kids LOVED them. They were not crumbly. I followed the recipe exactly except that I made mini muffins in one pan and baked corn dogs in the other pan (I poured the dough into regular sized cupcake moulds and then plunged 2 pre-heated (boiled) hot dog halves into each before baking). I mistakenly set the oven at 350F but it worked out well with the mini muffins taking 10 minutes and the larger ‘corn dogs’ taking 15 minutes. Two years after final diagnosis of celiac, I have decided to try my hand at baking gluten free from scratch. Mostly out of frustration and also due to not having the comfort foods I craved from my pre GF days. I have now made this cornbread twice, both times to top my cornbread chili casserole, a required tradition for the day of nesting on the first cold pre-autumn day….and it was amazing! I am so grateful for all the wonderful recipes and the serious testing that you both but into the recipes. I am now dedicated to using only the recipes from your site and cookboods, why waste my time and products on what is constantingly disappointing. Thank you for all of your hard work and sharing your life with us. Lu is such a delight to read of and obviously joy to all who share her life. Hey Lisa, I’m afraid to say it was the flour substitutions. You see, the different gluten-free flours have very different weights to them! So subbing by cup makes it a different batter. I wish that I had time to go back and re-bake every single recipe in grams! But I have to do this one soon. Thanks, Shauna! I will stick to your precise recipe. I didn’t even think about the weight differentiation between flours. (I am NOT a baker, clearly.) I’ll be making this for Thanksgiving, as well as some of your other recipes. Thank you!! I had the same thing happen, except I made no substitutions! I ended up stirring in at least another cup of milk so that the batter would be more fluid and not one thick glob. But 1 cup of liquid just doesn’t seem like enough to pull 2 cups of dry ingredients together into a thinner batter to begin with. Mine may have turned out great super thick, but I’m doing it in a hot skillet and I didn’t think I’d be able to get it spread properly. So we’ll see how it goes! Sounds like a wonderful cornbread recipe that I’m gonna try soon! Do you know what I could possibly substitute for shortening, though? My youngest son is allergic to soy, and soybean oil is the first ingredient in the shortening I’ve found. Thanks! I’m sure butter would be fine! I’d try 1/4 cup thick Greek-style yogurt for every egg. I’ve had some good success with that in baked goods! Maybe throw in a couple of teaspoons of psyllium husk too. Brilliant! Thanks so much! Have a glorious Thanksgiving!!! Happy Thanksgiving Shauna! I am in the thick of cooking and baking for company, but my cornbread just went into the oven and I just can not wait! We have a family full of Celiacs so finding a great cornbread recipe was a must. We have a few that don’t love sorghum flour, so I substituted coconut and added an egg and an extra tablespoon of shortening. It’s so fabulous…on Thanksgiving and with chili and for breakfast. Thank you for all of your wonderful ideas and for making me be more brave about mixing so many different flours! 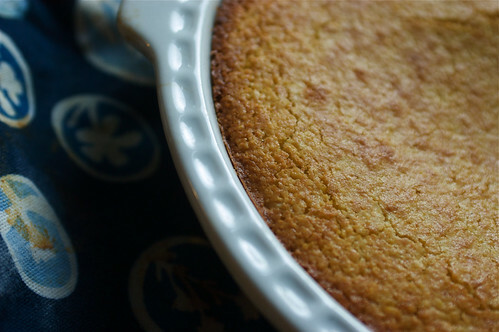 I made this cornbread for thanksgiving, and it was so good I am making it again for dinner tonight. Thank you for all of the excellent recipes that you share! I made this last night – my first official gluten free recipe. I had a guest with the requirement and so I made the adjustment for the crowd of 8. It was terrific. My husband, who is as picky as a child, said the only problem was he didn’t have a large enough portion, he could have eaten 4 servings. I just made this recipe tonight and I love it! It turned out perfect and is the best gluten free cornbread I’ve made; I’ll be sticking with this one. It looked as beautiful as the picture, and my roomates gobbled it up. I just made this and it was tasty. Even the non gluten-free family members enjoyed it with a healthy swath of butter. Thanks for this recipe and beautiful pictures! I just made this recipe and it’s was amazing, I think this may be the best cornbread we’ve made at home with or without gluten. The lard really does add such good flavor. Thanks for the great recipe, I absolutely love it! Great recipe! I substituted a bit because it’s what i had on hand. Love the blog & website, and looking forward to trying some recipes. I’m another “newbie” so am doing some floundering about and experimenting. But – the question of the day is, how on earth does one “measure” with grams? Do I need to buy some kind of scale? Just tried this recipe. Ever so easy and delicious! I’m coming to rely on you for the best gluten free recipes around. I’m also new, to this way of cooking! Growing up & living in Louisiana one is expected to cook a certain way! I swear my husband married me because I can cook! Well, I didn’t know about flour weight, still haven’t figured it out either. Made cornbread one night, gluten-free of course. My husband had a little fit; he wanted to know what in the world I did to HIS cornbread!! LOL, it really was funny! Back to the issue at had, is there a certain way to weigh to flour?? I really hate the wasting of so much food, trying to figure it out!! I am going to make your recipe tonite! I have everything on hand except the sweet rice flour. Can I sub plain white rice flour? Lastly, I’m sure this question is repetitive…how do you think this recipe would turn out sans the xanthan? Also, this recipe makes the best pancakes, cooked in a cast iron pan! My boyfriend, who is not even gluten-free, asks for them all the time! Thanks for posting the cornbread recipe. I will try making it for my friends this Forth of July weekend. Slid sideways and with much cat clawing into the gluten free thing, but am a massage therapist, so have to save my joints and be as inflammation free as possible, now that I am over 50 and seemingly breast cancer free again! This recipe was my very first try at baking anything gluten free, all by myself. I don’t like sweet cornbread, so I left out the sugar. Shauna has also had recent post about using or not using xanthan gum, so I left that out also. I have always used oil, not butter, so I substituted that for the shortening. I was being very daring for my first try, but I have read a lot of what Shauna has to say, not only her recipes and felt comfortable giving it a try. I also did not worry about over stirring b/c no xanthan. This was undoubtably THE best cornbread I have ever made. I baked in in one of those iron corn stick pans so every piece is really crispy. YUM! you people should never come to palm springs, my home town. People literally die from the heat. Granted they are older. Poor things. Anyway thank you for this recipe! I’m living in italy, the land of pizza pasta and bread. And recently learned that my silly little allergy to gluten is very serious indeed. I got very depressed thinking of everything i couldn’t eat but with this website and ones like it i’m sure i can live and eat very comfortably. Great recipe – I am a vegan gluten free eater so I swapped out the animal products for their plant based replacements and this was still fantastic! Darlin’ it is September… and 90 degrees in CLEVELAND, OHIO still but I have been waiting for months to make this. I can’t wait any longer… my thick northern blood will have to just sweat it through. This was great (even leaving out the xantham gum) and doubled well to bake in a 9×13 pan for a crowd. Enjoyed even by those who had no idea they were eating gluten free or healthy. One person did ask what it was . . . didn’t think it could be cornbread ’cause it was brown instead of yellow! (I used half sugar and half rapadura for sweetener) Thanks for making it so easy to find good gluten free recipes for anything I want to make! This recipe was REALLY fabulous in taste and texture! The only thing I would wish is that it had more corn taste. For the amount of cornmeal in it, I was surprised that it didn’t come through. I wonder if corn flour would help? Next time I will add some fresh kernels – yum! Lisa, all you need is 140 grams of whatever flours you want to use. And if you don’t have psyllium, may I suggest buying some? It makes this recipe even better. In the meantime, you can sub the same amount of xanthan gum for the psyllium. This reads like a really good recipe, but your narrative — the story behind the posting — is brilliant. I do have a question: I do not use shortenening. Ever. And I can’t use lard because my brother, who has Celiac’s also is forbidden by his religion from eating pork. Will not butter do in a pinch? Or will it ruin the whole thing?? Butter won’t ruin it! It might not have the same consistency but it will still be good! I was also hoping for the original flours and measurements used-its my go to cornbread recipe and I never printed out a hard copy. Thanks a bunch! So, I just don’t have the time to go buy a bunch of different GF flours and mix by weight. So, I saw an earlier comment, but I do have on hand Bob’s Red Mill AP GF Baking Flour. Is there anyway you can recommend how much to use please? A straight conversion yields me 5oz, but your recipe says 140grams of yours per 1c of other. Michele, you use 140 grams of the flour mix you have. Use the weight that is in the recipe! Well, now that seems so obvious! I’m just not used to weighing my ingredients! Thanks to you, I just figured out that my kitchen scale actually has grams as well as ounces! Is it possible to not use the psyllium husk? Or is pretty essential? Thanks so much! Erin, the cornbread will be more crumbly without it, but you can do it! Do you have any reply for my comment from yesterday? I was hoping to make it today. By the way, thank you so much. I made this to use in my Thanksgiving stuffing, and I had to make a second batch, because my husband and kids were powering it down! Just discovered you wonderful website after hearing you on KUOW talking about gluten free holiday cookies. I’ve been trying to make some gluten free bread without potato starch, substituting others starches, as I have an intolerance to potatoes. All failures I’m sad to say. They are either hard or doughy, though they have all tasted good. Any suggestions? Thanks.